This year will likely be remembered more for its political upheaval than its style shake-ups, but that doesn't mean there haven't been a host of remarkable moments worth noting in fashion, design, entertaining and society. In fact, when Globe Style's editors and contributors were tasked with identifying the top trends, products, events and personalities of the last 12 months, the shortlists they created highlight that the way we lived and shopped in 2016 was anything but status quo. From the influence of artists such as Frida Kahlo and Frank Stella on fashion to filling our just-decluttered homes with well-curated objects – plus the disruptive effect of a pricey hair dryer on the beauty business and vegetables acquiring more real estate on restaurant menus – standing out in style meant being brave, innovative and lighthearted enough to be original. 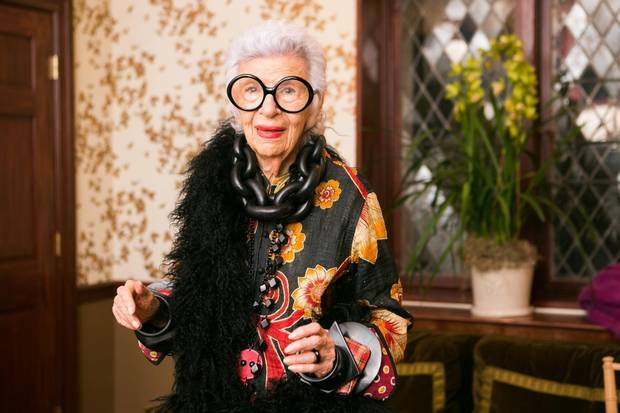 As eternal fashion icon Iris Apfel told Jeanne Beker this past November: "I think it's important to find humour in everything, because I think if you don't have a sense of humour about living, you might as well be dead." Nonagenarian fashion plate Iris Apfel. "The question I get most is, 'How do I vaccinate myself against the future?' Who knows what they're going to invent next week, next year, five years from now? How do I not end up being road kill in all of this? And the answer to that is to figure out what it is that you actually enjoy doing. I know people who go up to 70 or 80 and they never figured out what it is they enjoyed doing. But if you enjoy doing it – making pancakes, making shoes, chopping tree branches – then that's what you should be doing. It doesn't matter what kind of technology they come up with – you're always going to enjoy what you're doing with it." "Whenever I look at someone who looks very chic, it looks effortless. It's about not trying too hard, either with an outfit, or a hairstyle, or makeup… I've been in this skin for coming up on 60 years, and I think what I like is just me, hanging out, being real, feeling relaxed, feeling that my clothes are part of what's representing me, but they aren't me." "I think it's important to find humour in everything because I think if you don't have a sense of humour about living, you might as well be dead. I think taking yourself or your clothes too seriously is just terrible and that's a big mistake. There are a lot of well-dressed women who are very uptight about the way they dress and they take every button as a serious matter. That's ridiculous. No matter how well dressed you are, if you're not relaxed, then you don't look relaxed and you're not going to look well. I always say if being well dressed or being fashionable makes you uptight and uncomfortable, it's much better to be happy than well dressed." "I would say that we're very transient and adaptable and we have this objectivity, which I think allows us to stand alone. I certainly feel that way in terms of my own career. With Hollywood or the States or the rest of the world, it's like we're up here in Canada looking down on it all, and we absorb it all culturally but we have this distance from it. I think we used to be ashamed of that, but now it's become this massive tool that's making us stand apart." "There's no question that style goes far beyond what you wear. The people who I think are the most elegant are the people who make good eye contact, have a firm handshake, smile, brush their teeth… I'm constantly telling my son to look people in the eye when you talk to them. People will remember the way you treated them more than they will remember your outfit. That's important and that is part of style. I think those things add up far more deeply and have much more weight in the end than being able to put a couple of things together that look cute." Vancouver’s glitzy Face the World Foundation gala. Mad Hot Ballet, the National Ballet of Canada's top fundraising initiative, is held each year in the spring, and continually proves to be one of the country's most important and wildly fun events. Co-chaired this year by Bernadette Morra and Victoria Webster and held at Polson Pier, a venue by the water, the gala drew a dreamy mix of ballet supporters including Jonas and Lynda Prince, Jay Smith, a first vice-president with CIBC Wood Gundy, and my hosts Ryerson and Michele Symons. There were gen-next movers, too, like Fernanda Dovigi and Jenna Bitove, and fashionable party fixtures including decorator Colette van den Thillart and Sarah MacDonald out for good measure. Presiding over it all: Karen Kain, who was celebrating 10 years as artistic director of the ballet company. Later in the evening, dancers of the professional variety, including Evan McKie and Heather Ogden, kicked it up well into the night with dancers of the very much non-professional-but-A-for-effort sort. I have never not had a fantastic time at a Montreal ball. The Montreal Museum of Fine Arts ball, held in support of the museum, is an absolute must attend. Unlike other cities, where galas are held mid-week and become a sort of obligation, this one gets going on a Saturday with 900 or so excited guests, who later in the evening are joined by the museum's Young Philanthropists' Circle just in time for dancing (an activity, alongside table-top vodka shots, that Montrealers take very seriously at their balls). In the crowd this year were backers of the fine arts, including Scotiabank CEO Brian Porter, Michael Penner, chairman of the board of Hydro-Québec, Minister of Canadian Heritage Mélanie Joly, style setter Dominique Bertrand, and Transcontinental Inc. board chair Isabelle Marcoux, all of whom helped raise $1.2-million for the musée. The latest instalment of Contemporary Calgary's high-energy and incredibly well-attended annual fundraiser featured a big name, Steve Martin, who spoke on-stage with writer Adam Gopnik. Star power or not, however, the event always sells out early and is on the social calendar of every in-the-know Calgarian for good reason. The evening is capital-F fun and is served with a side of substance, all in support of the city's fantastic new home for contemporary art. Among those in attendance: Can-art superstars like Kim Dorland and Janet Were, mover/shaker duo Jay and Viviane Mehr and old-guard big givers Morris and Ann Dancyger. The Governor General's Performing Arts Awards, held in the nation's capital, is a truly Canadian event that I look forward to each year. The evening is a chance to celebrate the performing arts and honour a fascinating crop of creators who have contributed greatly to the cultural fabric of this country. A grand dinner is served inside the National Arts Centre for big givers who come from far and wide for the evening; among them this year were Earle and Janice O'Born, Salah Bachir and Jacob Yerex of Toronto and Gail Asper of Winnipeg. After, it's a full-on production on the Southam Hall stage. Oh yes, and David Johnston, the Governor General himself, was there, too. He and his wonderful wife Sharon, fresh off a plane mere hours after celebrating the Queen's 90th birthday across the pond, made it just in time to celebrate Canada's talent at this year's event. At the helm of this event's 26th edition was Jacqui Cohen, the bold and connected president and CEO of Army & Navy Department Stores, who opened her palatial waterfront home to a few hundred guests for a glitz-filled good-time gala. Since the event's launch a quarter century ago, over $17-million has been raised and distributed to a bevy of local organizations, and come 2017, Jacqui and daughter Kasondra will join forces to grow the event by engaging with a wider age range and broader audience. Kit and Ace co-founder J.J. Wilson was in attendance this year, as were Keg CEO David Aisenstat and Concord Pacific's Terry Hui. And on stage was Steven Page. 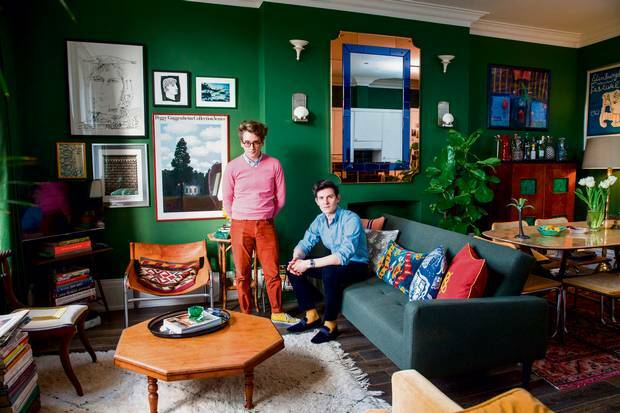 Luke Edward Hall, left, and Duncan Campbell in their north London flat, February 7, 2016. With everyone Marie Kondo-ing their homes, minimalism is hot at the moment. But it has been a lifelong pursuit for lawyer-turned-designer Jeanette Hlinka. "I am, as you can see, a minimalist," she explained. "I was born that way." The expansive living room in her hundred-year-old home in Toronto's Casa Loma neighbourhood is filled with an intriguing mix of pieces. From the antique Chinese lacquered cabinet to the Barcelona daybed by ultimate minimalist Mies van der Rohe to the contemporary loveseat by Toronto-based designer Sarah Richardson, all exist in a perfect symbiosis. Having spent most of their life savings on a transcontinental move, Spanish architects Clotilde Orozco and Alejandro Sanguino were left with a shoestring budget for decorating their Strathcona basement rental apartment. So, naturally, they built their own furniture by utilizing inexpensive plywood sheets and framing lumber, and combining them with alley finds. The result: a whimsical take on a family room, complete with a play kitchen for their young daughter. "We decided it was an opportunity to do something different than what we had in Madrid, which was a regular house with tables and chairs," said Sanguino. Different doesn't even begin to describe this DIY wonder. When interior designer Nam Dang-Mitchell first laid eyes on her turn-of-the-century Calgary home, she was expecting to see an Upstairs, Downstairs-style kitchen, but instead, she got something out of Mad Men. The designer set out to recreate what she imagined the kitchen would have looked like in its former glory, with additional inspiration from her European travels. "In big mansions and châteaux, my favourite areas are always the kitchens, the servants' quarters," said Dang-Mitchell. "They just have this life about them and austere beauty, which is such a contrast to the opulence of the rest of the house." Of course, unlike the fictional Bellamy family of Upstairs, Downstairs, no help is needed here when concocting delicious meals. There is something to be said about British charm, and Luke Edward Hall's London home has no shortage of it. The London-based artist and interior designer and his partner Duncan Campbell find joy in collecting rare pieces such as the 1960s leather Walter Antonis sling chair, Fontana Arte Murano glass mirror, and the Paolo Buffa bar cabinet with malachite panels, a prized antique find. Decorating is an ongoing process for the couple. "I don't think a home is ever really finished. That's the fun," said Campbell. "These are things that we have acquired together over the years, and each one has a story attached." Combine that with an enviable art collection that includes works by John Bellany and Tinko Czetwertynski, and the young couple is truly living the maximalist dream. Bright colours may not be Steven Cook's thing, but the former chief merchant at Holt Renfrew can work black and white like no one else. "It hasn't been conscious because I've kind of bought what I liked, but everything is very graphic and crisp and very tailored," said Cook. His downtown Toronto condo features some true rarities, including a 1930s mahogany table that once belonged on the Normandie, a famous cruise ship with interiors designed by Emile-Jacques Ruhlmann, and the 1909 velvet parlour set by Josef Hoffmann. The old-timey glamour is coupled with an impressive collection of art and design books, providing inspiration at every step. The buzziest launch of the year may have very well been for the quietest product. Dyson spent four years and about $100-million on its first-ever hair dryer, a futuristic device that boasts precision airflow, reduced noise, lighter hand-held technology and intelligent heat control. The company, known for its state-of-the-art vacuums and fans, recruited a team of aero-acoustic engineers to push the tone of the motor to a sound frequency beyond the audible range for humans, bringing peace, quiet and great hair to your morning routine. $499 at Hudson's Bay (www.thebay.com) and through www.dysoncanada.ca. Travelling light is easy – until you have to pack your toiletries, that is. Keeping it below the 100-mL limit for carry-on luggage is next to impossible for those of us with a skincare routine that boasts (gulp) 10-plus steps, but Neutrogena has got our backs. The American company launched a solid sunscreen this year that's basically like a deodorant stick, but with waterproof broad-spectrum UV protection. Anything that adds sun protection and room in my suitcase for more serums has got my vote. $13.99 at mass-market retailers. The matte-lip trend was arguably the biggest colour cosmetics product news story of the year, made popular on Instagram and taken viral by Kylie Jenner and her popular Lip Kits. While countless brands launched their own matte liquid lipsticks, Armani's version, the Lip Magnet, is wispy in comparison, drying down to a width that's smaller than the diameter of a hair. It has the desired matte finish, stays put and imparts a "bare lips" sensation. The end result is a comfortable wear for those of us who need our lipstick to last IRL, not just on social media. $45 at Sephora, Holt Renfrew, Hudson's Bay and Nordstrom. Skincare companies never shy away from bragging about their new technologies, incorporating impossible sounding ingredients with equally impossible sounding results, but this is one instance in which I welcome the boast. For a process that's as delightful as it is innovative, Nannette de Gaspé's masks for face, eyes, hands, neck and mouth use a dry delivery system to get anti-aging ingredients into the skin. The company's namesake founder is also the executive chair of Quebec-based Biomod, a company that creates wearable tech for the health and beauty fields. Instead of using water to deliver active ingredients to skin, these masks are activated by pH, heat and movement for a more concentrated hit of anti-aging goodness. $145 at Holt Renfrew (www.holtrenfrew.com). In today's "as you like it" era of ultimate customization, there's no longer a need to settle for something that's just good enough, as M.A.C's InstaCurl mascara demonstrates. The name is a true double entendre, as the formula curls lashes upon application for all-day, flake-free hold, but here's where it gets interesting: The wand can be twisted to curve the brush, so that it can be moulded to fit every eye shape, catching even the tiniest corner lashes. What seems like a small adjustment makes a big difference when it comes to our never-ending quest for Bambi-like lashes. $27 at M.A.C stores and counters (www.maccosmetics.ca). Frank Stella’s graphic pops of colour. I love graphic shapes, colour and patterning, so Frank Stella is an ideal inspiration for me style-wise. I visited his retrospective at The Whitney last year and was immediately excited to explore a potential connection between his work and what was appearing in the style landscape. 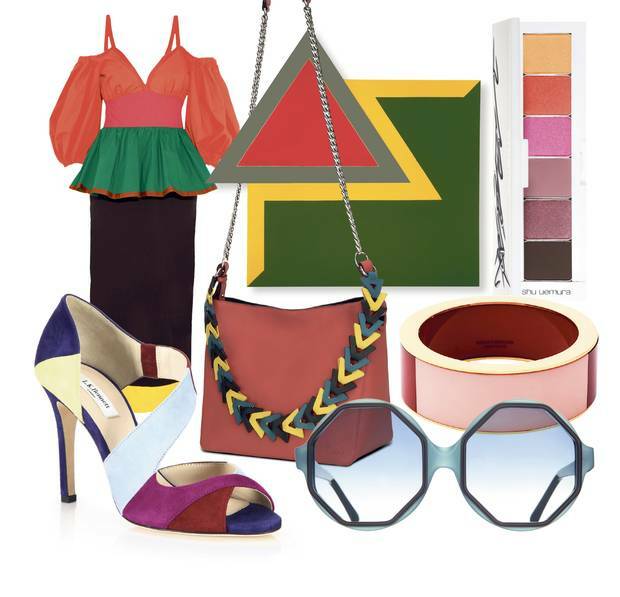 I loved being able to pull together pieces – including that spectacular Loewe bag – that celebrate all of those things. It's such a happy assortment! As a person who falls into the "has everything category," my favourite gifts to receive are ones that will last, and even improve my life somehow. I find the frivolity of many holiday gift guides upsetting given where our consumer culture is at right now, so I wanted to focus on items that have an elevated sense of usefulness. Some thought the deodorant was unromantic but, hey, giving the gift of toxin-free beauty sounds quite lovely to me. I also enjoyed putting together the other Valentine's Day gift round up we ran, which celebrated mild misanthropy by way of sarcastic, witty items that said "meh" to love. Even for people who aren't single, the tireless messaging of eternal connections can be a bit much around that time of year; it was fun to turn a traditional gift guide on its ear. When Assouline published its new book about Friday Kahlo, I knew it would make for a vibrant style story. Frida has been the inspiration to many performers and personalities, and her iconic work and sense of style will undoubtedly continue to spark imaginations for a long time to come. I was very happy to be able to include a few Mexico-based brands in this story as well. Exploring the relationship between all facets of style is very interesting to me, so I relished the chance to connect Florence Welch's shimmering Gucci gown that she wore to the MET Gala with some novel items for the home. Sometimes people prefer to take greater risks with their style behind closed doors, and what better way to add a little oomph to the kitchen than an iridescent serving spoon?